Africa continues to make slow progress in achieving international hunger targets, despite over a decade of pro-growth and food security policies and programs such as the Comprehensive Africa Agriculture Development Program (CAADP). According to the FAO State of Food Insecurity in the World (2014), sub-Saharan Africa (SSA) has the highest undernourishment prevalence of all included regions. While the numbers of undernourished have globally decreased from 1,015 million people in 1992-1994 to 805 million in 2012-2014, the numbers for SSA increased from 176 million in 1990-1992 to 214 million in 2012-2014. Of 805 million undernourished worldwide, 214 million (27 percent) are in SSA, representing 25 percent of the region’s total population. To reverse that negative trend and end hunger by 2025, the African Union Member States in their June 2014 General Assembly in Malabo, Equatorial Guinea, resolved to accelerate agricultural growth by at least doubling current agricultural productivity levels. The majority of the world’s poor live in rural areas, and agriculture is their most important income source. Developing the potential to increase the productivity and incomes from smallholder crop production systems will be the key to achieving global food security over the next 20 years. Climate change is expected to hit developing countries the hardest. Its effects include higher temperatures, changes in precipitation patterns, rising sea levels, and more frequent extreme weather events. All of these pose risks for agriculture, food, and water supplies. Resilience is therefore a predominant concern. Climate-smart agriculture (CSA), an approach that helps to guide actions needed to transform and reorient agricultural systems to effectively support development and ensure food security in a changing climate, is critical. The ability to apply site-specific nutrient management to match spatially and temporally variable conditions can increase application efficiencies and reduce environmental impacts while improving yields. Thus, precision farming technologies are critical. They can spatially vary nutrients and water prescriptions within a field based on various information sources (soil properties maps, terrain attributes, remote sensing, yield maps, etc.). Soil- and crop-specific fertilization, as well as balanced plant nutrition, could significantly increase crop productivity. Fertilizer deep placement (FDP) technology has also proven to be an innovative fertilizer use efficiency strategy with sustainable returns on investment. Several studies across SSA have shown that significant yield increases (20-60 percent in upland maize and 200-300 percent in irrigated rice) are achievable and have been realized with less fertilizer inputs, relative to the conventional farmer practices. In 2011, the International Fund for Agricultural Development (IFAD) proposed that the key measures to boost food security, feed future generations, and reduce poverty are: (1) getting young people interested in agriculture by introducing modern technology, training, communication, and information; and (2) improving the image of agriculture to be more technology-centered and business-oriented, ultimately making the field less risky. 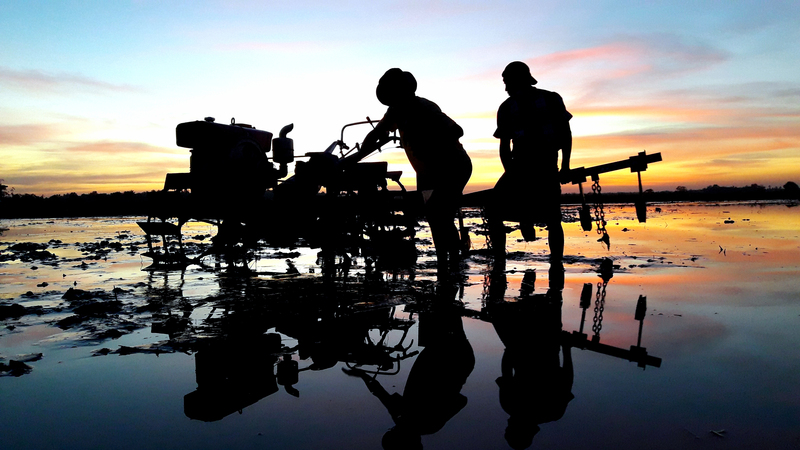 Thus, there is a pressing need to rebrand agriculture to address the long-held belief that farming is for those who cannot make a livelihood anywhere else. Agriculture needs to be branded as the new unexploited frontier for growth in business opportunities. With an aging population of farmers, it is clear that agriculture needs to attract more young people. In many ways, young people do not see agriculture as an active, profitable profession. By embracing and incorporating new technologies, the field can encourage youth to see past the stereotypes of traditional farming and help them view agriculture as an exciting and innovative industry. Incorporation of information and communication technologies (ICTs) is another way to provide new opportunities for making agriculture more interesting to young people. There is under-utilization of ICTs for agricultural production and marketing. It is essential to digitize agricultural production, processing, and marketing information into web-based resources to increase outreach and use. Using ICT skills for farm planning, production, and marketing could improve the productivity and profitability of farming activities through high yield prices and farm income. The use of ICTs in agriculture will increase opportunities, and motivate and increase the capacity of youth to engage in profitable agriculture, target niche markets, and make agriculture an occupation worthy of investing time, effort, and financial resources. In SSA, small and marginal farmers constitute more than 50 percent of total farming communities. Nearly all small and marginal farmers across these continents practice rainfed cultivation. Erratic, inadequate, and delayed rain often results in crop failure and, in turn, fuels severe food insecurity, financial loss, and large-scale migration to towns and cities. The strong dependence on rainfall for crop production in SSA is therefore a great concern. Long-term changes in the patterns of rainfall and more extreme droughts – all symptoms of climate change – are expected to shift production seasons, alter pest and disease patterns, and modify th e set of feasible crops, greatly affecting production, prices, incomes, and ultimately livelihoods and lives. For example, in northern Ghana, the annual maize yield loss from drought is estimated at 30 percent, but localized losses might be much higher in the marginal areas where the annual rainfall is below 500 mm and soils are bare or shallow. Adapting to climate change, among other interventions, may involve the use of crop varieties that have the ability to cope with higher temperatures, drier conditions, and emerging pests and diseases. Hence, a range of crop varieties and hybrids that are early maturing and/or drought tolerant have been developed and need to be introduced to farmers. With the increasing frequency, duration, and severity of drought conditions across much of the African continent, smallholder farmers are looking for new ways to ensure that their harvests are secured against erratic rainfall patterns. The Bhungroo Innovative Water Augmentation and Management (BIWAM) and the PAVE Irrigation Technology (PIT) are two technologies that are farmers’ best bets for water management. These rainwater harvesting and aquifer recharging irrigation technologies save farmers’ standing crop in flash floods while ensuring water for cropping in the dry season, thus guaranteeing water and food security. This globally recognized, disaster mitigating, and irrigation guaranteeing technology filters, injects, and stores excess farm water or storm water underground for usage in dry periods. The technologies are designed for storing water for dry season farming, but they also supplement irrigation during short rainy periods. Thus, lands once prone to submergence and unusable for cropping can now be used for double cropping with the BIWAM and PIT technologies. These technologies can play a key role in increasing crop yields, conserving water, and creating a source of income for smallholder farmers in rural communities, creating a “triple-win” toward more sustainable development. Many of these technologies, as well as the concepts and approaches in strategic farming, are directly applicable to agricultural production across the entire SSA region and in most developing country environments. Therefore, the training will provide participants with a unique opportunity to develop their professional skills and collaborate. IFDC is uniquely positioned to stay abreast of the latest technologies related to soil fertility management and agricultural development around the globe, particularly for the smallholder farmer. IFDC has well-established relationships with essentially all public and private sector organizations that impact agricultural production. This training will allow participants to interact with some of these organizations including, but not limited to: farmer organizations; International Water Management Institute (IWMI), Conservation Alliance, AfricaRice, International Institute of Tropical Agriculture (IITA), research and education institutes of major agricultural colleges and universities; and many large- and small-scale farmers. Interactions with these entities will provide the participants with an opportunity to see how farmers, agribusinesses, and policymakers are adjusting to today’s agriculture challenges in ways that ensure agriculture remains a competitive enterprise in SSA. Youth and women in agriculture and innovative farmers. Agronomists, soil scientists, researchers, and extensionists from national and international agricultural research institutes and universities. Policymakers from governments and ministries in charge of agricultural productivity and planning. Executives and managers of fertilizer and agricultural input organizations will find this program extremely rewarding. Representatives of international organizations and donors involved in developing strategies for increased agricultural production through the use of emerging technologies that promote resource conservation and increased efficiencies should also benefit from the program. National commissions of agriculture, as well as international associations of horticultural producers, will also find the program useful. “Smart” fertilizer use (FDP, balanced plant nutrition and fertigation, etc.). Efficient fertilizer products (controlled and slow release, nanotechnology). Precision agriculture: site-specific land management. Integrated Soil Fertility Management (ISFM) and soil management practices that increase soil organic matter. Empowering youth in agriculture: lessons learned. ICT for agricultural production and marketing. Improved seed development and their broad dissemination and adoption (improved varieties and hybrids, etc.). Management (BIWAM) and the PAVE Irrigation Technology (PIT). Post-harvest handling and storage practices. International faculty from IFDC and other international experts. Diverse and participatory activities based on training activities, key lectures, and films. Training material handouts for permanent reference. Three-and-a-half (3½) days of classroom-style presentations and discussion opportunities and one-and-a-half (1½) days of field visits. The discussions and interactions will generate considerable information that will help prepare participants to improve their abilities to compete in the global market and assist farmers in their day-to-day operations. The five-day training session will include lectures, case studies, field visits, and demonstrations of tools and methodologies. These will demonstrate the current technologies that can help smallholder farmers improve their productivity and livelihoods while simultaneously preserving the environment. All training deliberations and presentations will be conducted in English. Faculty for this training program will include IFDC specialists with more than 25 years of agronomy and soil science experience with a focus on improving nutrient use efficiency and facilitating the transfer of innovative agro-technologies. Other faculty participating in this training will include international experts, farmers, extension agents, public sector researchers, entrepreneurs, and other representatives of the private sector involved in using, supplying, or developing the technologies. The training program will take place in Accra, Ghana, at the Erata Hotel – a three-star facility situated in the serene environs of East Legon and residential area in Accra, the capital city of Ghana. The hotel is conveniently located: a 10 minute drive from the Kotoka International Airport, 30-minute drive to Accra City Center, 20 minute drive to Aburi Botanical Gardens, and 5 minute drive to the University of Ghana. Erata Hotel has over 50 well-furnished, air-conditioned rooms and offers a complimentary shuttle from the airport. Participants will be extended IFDC’s negotiated special rate of U.S. $80.00 per person/per night for bed and breakfast (inclusive of taxes). This rate is valid for reservations made NO LATER THAN January 2, 2017. 2016. After this date, reservations will be subject to room availability and at the best available rate. Participants will be responsible for reservation and payment of accommodations at the Erata Hotel. Participants should plan to arrive in Accra, Ghana, on Sunday, January 22, 2017. APPLICATIONS FOR VISAS SHOULD BE MADE AS EARLY AS POSSIBLE. Participants who are not eligible to enter Ghana without a visa should apply at the nearest consulate of Ghana for a visa. All required immunizations and health formalities should be completed. Medical insurance should be obtained by participants. The training program fee does not cover any medical insurance or expenses. The program fee for this training course is U.S. $1,650 per participant (inclusive of a U.S. $250 non-refundable deposit) and should reach IFDC no later than January 2, 2017, three (3) weeks before the program is scheduled. Those received thereafter will be accepted at IFDC’s discretion and incur a late fee.Please refer to the table for pricing. The program fee, minus the non-refundable deposit, will be refunded for cancellations made two (2) weeks before the commencement of the program. Ninety percent of the paid fee will be returned and 10 percent, in addition to the deposit, will be charged to cover administrative costs for cancellations made between two (2) weeks and one (1) week before the commencement of the program. Cancellations made less than one (1) week before the commencement of the program will receive no refund. Registration will be on a first-come, first-served basis. Paid participants will receive priority. An organization wishing to enroll more than one participant should supply information and payment for each participant. Payment of the program fee can be made by: (1) check or draft payable to IFDC; (2) wire transfer to IFDC’s account in the U.S.A. through First Metro Bank, 406 West Avalon Avenue, Muscle Shoals, Alabama, U.S.A., ABA number 062203955 for credit to IFDC account number 55281; or (3) major credit card – MasterCard, Visa or American Express. The program fee covers registration, training and reference material, coffee/tea breaks, all lunches, and surface transportation on field trips. The fee does not include air travel, lodging and dinner expenses, or medical and communication expenses. IFDC is a nonprofit, public international organization (PIO) dedicated to increasing agricultural productivity and food production through the development and use of plant nutrients in sustainable crop production systems. Headquartered in Muscle Shoals, Alabama, U.S.A., IFDC is involved in human resource development, research and technical assistance in collaboration with public, private, national and international organizations throughout the world. IFDC has conducted more than 700 formal workshops, study tours and training programs for over 11,000 participants from over 150 countries since 1974. The programs have covered a wide range of subjects including integrated soil fertility management and fertilizer use efficiency, fertilizer production technology, agro-input dealership, competitive marketing, supply chain management, investment analysis, policy reforms and numerous specialized topics. P.O. Box 2040 Muscle Shoals, Alabama 35662, U.S.A.
As a nonprofit organization, IFDC does not finance or sponsor any participant.